I knew when I read that Jack Wilder was saying this new series with 50 States of Love was going to kill him and Jasinda by the end that I HAD to read them ALL!! Mainly, I just enjoy Jasinda Wilder's writing and was really excited to see how the books were related to their titles state. This book, Pregnant in Pennsylvania, was adorable! Elyse is a local lifer. She's lived in Clayton all her life only leaving for college and returning once she finished college. Her life was exactly what she wanted... small town living and raising a family. Until one day, ever changed for Elyse and her ex-husband Dan. Elyse and Dan created a sweetheart named Aiden. It was just Elyse and Aiden. They formed a really sweet mom and son bond. This has to have one of the most adorable book openings I've ever read with single parents. I think this is what Elsye had a hard time moving on from. Change is hard. Fear is deep especially when you're a single mom with double the fear. You aren't just protecting your heart but the heart outside of your body. The new man in town is persistent and the situation isn't as simple as just a man and a woman liking each other. But Jaime is smitten and he doesn't give up! I really adored him quickly. If I had to complain about anything with this book is that I really wish it had been in dual POV. I would have loved reading Jaime's personal thoughts. I've never been to Pennsylvania besides driving through, it seriously feels like the state goes on forever and there's always construction going on... and oh man the deer are plentiful!! This felt like a small town story with tons of normal, everyday real feelings and fears. I really appreciated the way Elyse made herself think positive things about herself for each negative. It's a good reminder that we all age and our bodies change as we get older. Elsye is a character that most women, especially moms, are going to relate too. I'm really excited for the next book!! 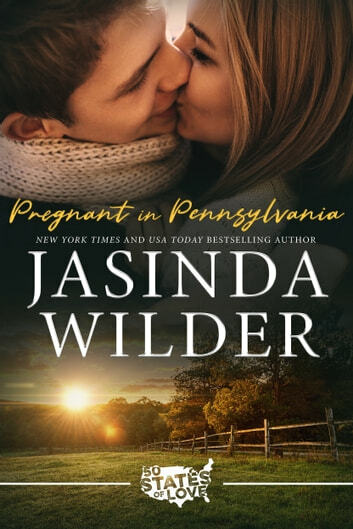 Pregnant in Pennsylvania by Jasinda Wilder is the first book in a brand new series of standalones. Meet Elyse and Jamie. Elyse is a divorced single mom. She still carries scars from her divorce but on a night out she meets her fate - only she doesn't knows it, yet. Jamie is the new elementary school principal, her son's principal, a good man with the patience of a saint. He fells for Elyse, hook line and sinker. But Elyse creates excuse after excuse only to keep him at arms length. Pregnant in Pennsylvania is a quick, witty and fun read and I greatly enjoyed reading Elyse and Jamie's story. 4 stars. The wonderful Wilders are taking us on a romantic trip around the USA. We start in small town America, in the state of Pennsylvania. Family owned businesses, main street gossip, and of course football. Elyse is the high school guidance counselor and a single mother of a little boy. She was hurt so badly by her husband, that she doesn't want to pursue a relationship to protect herself and her son. She meets an attractive man on a night out on the town with her friends. There's a surprise for her when school starts. Can Elyse overcome her fears, and commit to the man of her's and her son's dreams. I'm looking forward to the next 49 states in their new 50 book series. As always the Wilders combine heartfelt romance, a little suspense, and a bit of comedy to create an emotional, well written story. Enjoy the road trip! 5 STAR Review by Jodi for Ruby Red Romance Review This book was like coming home. This book had my heart melting and my heart breaking. Let's see if I can put into words how much I loved this book. Jasinda Wilder had me falling in love with Elyse from the very beginning. She's caring, compassionate, loving and devoted. She loves her son so much. She does everything she can for her students. She's not ready to give her heart over again and that was hard to watch. She has so much to give. Jamie is amazing. He's patient and willing to wait for Elyse. Watching Jamie love Elyse when she could love him back was more than I bargained for. Watching him love her son, made me melt. I loved this story from start to finish and you will too. I love the idea of what's to come with this series. Hold on...because we have 49 more states to come. I am so excited about this new series from Jasinda Wilder!! It will be like traveling through all the states, like a huge road trip!! Plus the romance!! I am so excited!! Pregnant in Pennsylvania, is a second chance love between two people that have been hurt previously and need to trust and love again. I loved the characters, the little town romance, as well as the plot. It's not like you are having a surprise in the end, because the title says everything, but it's the how you get there that makes the difference! I loved it!